In the past week my eyes have been opened to the fact that it is wonderful to belong to a church family. In four different moments I had a deep sense of love for my neighbors and gratitude for my village of residence. The first was during last week’s Relief Society (my church’s female organization) activity. We had the most fun back-to-school themed activity where we had workshops about lifelong learning, community volunteering, healthy lunches, and teacher’s gifts. After the great informative classes taught not by experts but by my fellow church-going women who studied and shared knowledge (thank you Pinterest) we had a fun recess and lunch. The ladies shown below made me laugh with their hairnets and it was just so enjoyable to sit and chat with other women while eating a cafeteria style lunch. Then on Saturday we had a pretty big storm and a neighbor posted on Facebook that they had a large fallen limb threatening to crush their fence. By the time we got to the house to help the limb was not only dislodged but cut into pieces. Ten others had showed before us and working alongside them felt like a sacred privilege. Bella was really sad that for the third year in a row she wasn’t going to have a grandparent at grandparent’s day. She is sensitive like that and I wanted to be accommodating. My parents live four hours away and my in-laws live across the country. Lucky for me she has a special relationship with one of her previous primary leaders. When I called to ask Joyce if she would be willing to be Bella’s adopted grandparent she said, “It would be my privilege.” I hung up the phone with tears in my eyes. 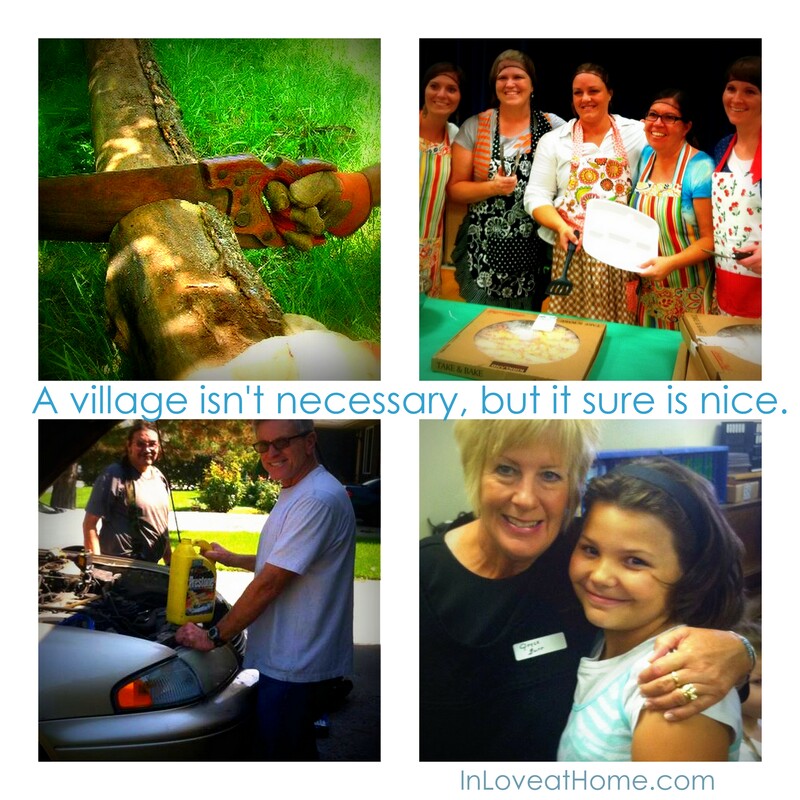 Later that day while walking through the neighborhood I saw two home-teachers out not just doing their home-teaching but going the extra mile and changing a starter in the car of a single mom. I got a lump in my throat and turned back to take a picture. I just knew that I had to share the joy of living among like-minded neighbors who all look out for each other. I am so blessed to live in a pretty great village. Now, how do I get those home-teachers for when my transmission gives out? Just kidding. Kind of. I look forward to sharing more African Proverbs. I’ve added a menu up top inspired by this query on pinterest. I hit the jackpot on wisdom on Pinterest and in my choice of neighborhoods. After I prepared for this post on Tuesday with the above pin, I went to pick up my girls from their activity at church and discovered that our family had been blessed this week yet again. One leader covered for another leader in emergency and by herself she forged through the originally planned activity. 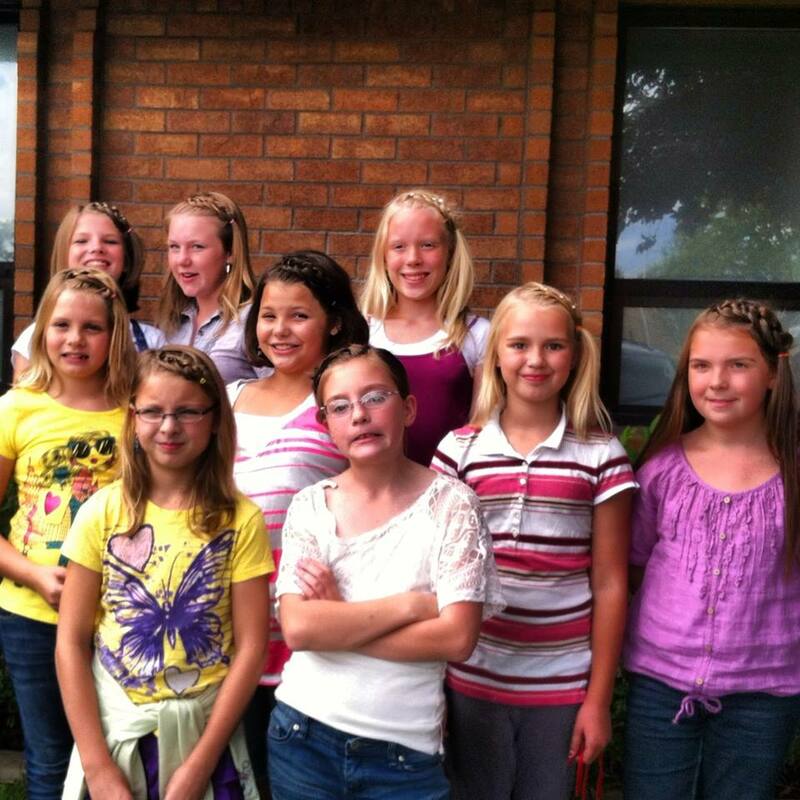 She single-handily did every one of these girls hair all pretty as promised. I have four daughters and I don’t think in my entire motherhood career I have done that much hair. The neighbors in my village are pretty phenomenal. 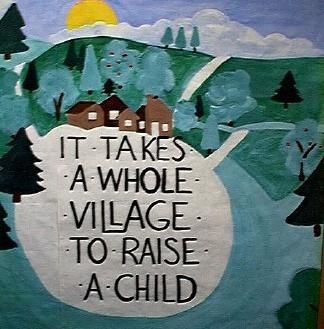 I hope you are blessed with a village just like mine. If you aren’t, no matter where you are in the world, there is probably one just like them to be found at your nearest The Church of Jesus Christ of Latter-day Saints. By their fruits ye shall know them. 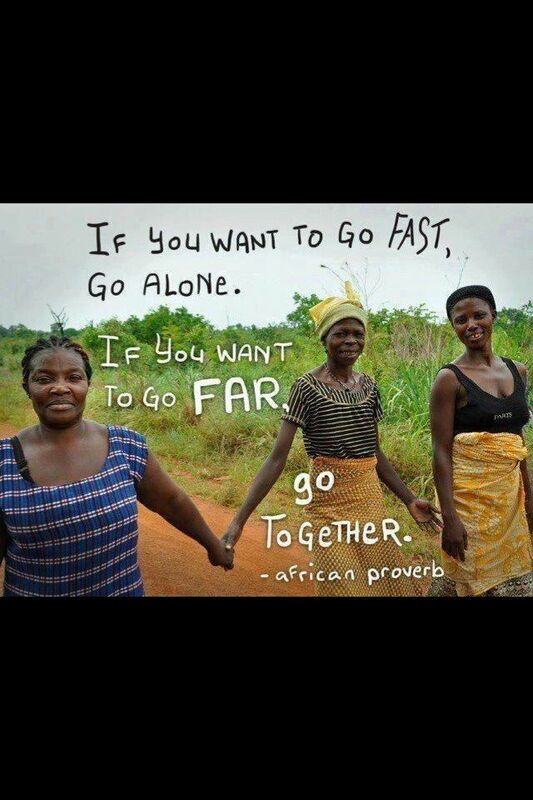 Posted in African Proverbs, InLoveBlog, Mormon Doctrine and tagged friends, Utah on September 12, 2013 by alicewgold. I’m blogging during Sunday School to the utter disgruntlement of my hubby. Any minute he will look over to the screen of my I-pad, read this, and shake his head at me. I think God’s o.k. with it as He knows I seek Him in my life and understands my struggle to pay attention in this class. (Oh please don’t get this back to my Sunday School teacher). I almost just made a comment so I guess I am really safe because apparently I can multitask. Heavy on my heart today is the topic of sisterhood. In our last meeting we got to hear from the beautiful young women of our congregation and to my pure delight my daughter Abigail was among them. She’s so beautiful and has grown up strong and insightful. I’m so proud of my girl. She took my breathe away today. How did this struggling mom raise such an absolutely amazing creature? God is good. Abigail shared a little story about her girls’ camp experience. They went geo-caching and she was so frustrated when she couldn’t find a cache and was disappointed in her intellect when another girl found it before her. (I chuckled as this girl relies on her smarts and believes in them 100% – just like her dad – I wish I could have that intellectual confidence) She talked about how she had realized through the experience that Rachel (the girl who had found the cache) had served as a reminder to the importance of the Holy Ghost. Abigail realized she would never know everything, but God would be there and send her the Holy Ghost to help her when she didn’t. With the help of the Holy Ghost, she could get from where she was stuck to where she needed to go. What more could a mother ask for her daughter to know? I can’t think of anything. I was so so grateful for all the leaders who helped Abigail to have this experience. Here you can find the touching song that Abigail and her fellow sisters in the gospel learned this week. When they sang it today I bawled like a baby because through this music, sung by women alone, my daughter had the opportunity to learn of her capacity for good. And so much good she and her sisters in the gospel will do. Posted in African Proverbs, InLoveBlog, Music, Pins, Womanhood and tagged African Proverb, GirlsCamp on August 11, 2013 by alicewgold.